SpringBoard comes with an opportunity to collaborate with peers as well as establish a disciplined math practice during Spring. Not just that, students get rewarded with a multitude of fun characters as they achieve their weekly practice milestones. Let the students know that they can access Splash Math on any device, and can continue to use it at home as well. This way, classroom performance continues to log on the Splash Math dashboard, and students will emerge strongly on the other side of spring break. Nothing moves a young child further than timed guidance in the well-identified area. Splash Math dashboard provides student and skill level information in easy-to-view dashboards. You can take advantage of the teacher dashboard to monitor class activity at a granular level, and help students at precise moments when they need it the most. For young students (aka our littlest math learners), small wins mean a lot. And over a period of 10 weeks, while contesting for this SpringBoard math challenge, these students unfold/ turn out from being ‘tentative’ to ‘confident’ math champions. Further, Splash Math provides digital versions of ‘Student Certificates’ each week for top performers. We believe that your students will appreciate receiving those certificates in print in front of the whole class. It not just boosts [their] ‘math morale,’ but also motivates their peers to work towards achieving similar goals. Most of all, SpringBoard quintessentially showcases your classroom’s math performance in a story-like fashion through a classroom-wide collaboration activity. When each student’s efforts come together to create a personalized jungle for their respective classrooms, they become a part of creating a memorable math experience for their school and community. 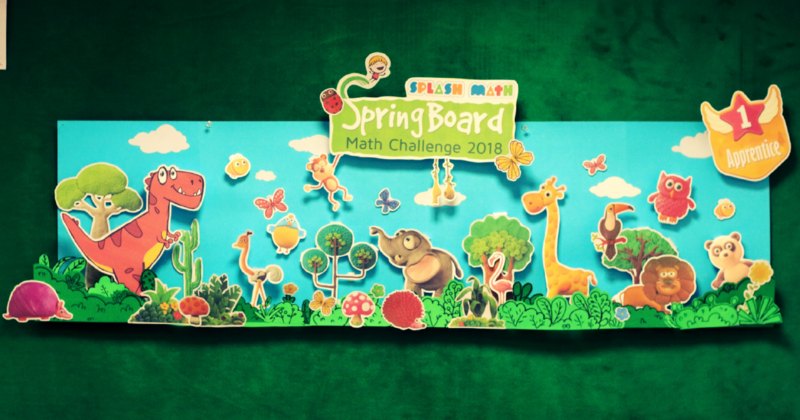 And so, to celebrate the love of math, we encourage you to prominently display the SpringBoard banner and the fun characters that go on it each week, so students are continuously in-tune with the co-creation opportunity SpringBoard brings. SpringBoard also has nationwide leaderboard showcasing top performing classrooms across USA and Canada. The board is updated in real-time, and you will receive an email every Monday so you know where your classroom stands. Keep up the good work. We hope to see your classroom shine! Why not encourage other schools by showcasing your classroom’s enthusiasm. Share some pics of your students with SpringBoard banner. Don’t forget to tag us on Facebook (@Splash Math), Twitter (@Splash Math).